* Special Order Only: Minimum quantity is required. 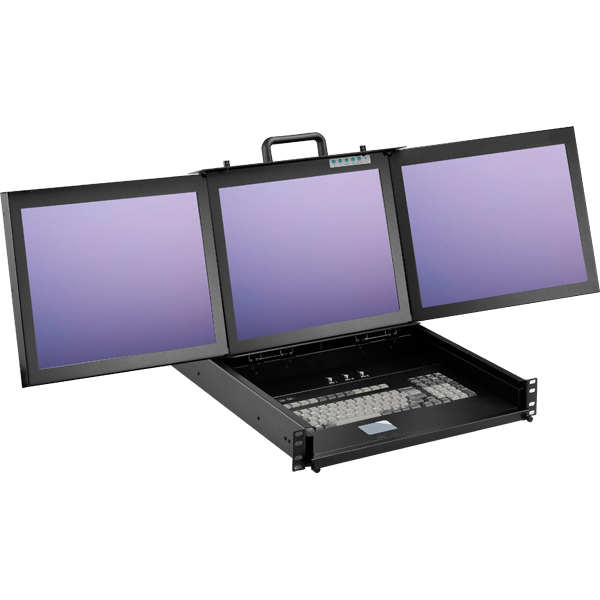 The Trident is a 3U rack-mount drawer with an integrated keyboard drawer and 3x 17" LCD monitors. These monitors have high contrast ratios (500:1). They fold away to fit neatly into 3U rack space. Each monitor has an independent OSD control, allowing independent panel control or control of all panels simultaneously. The base includes a 105-key keyboard, 2-button touchpad, and selector buttons. In the back, you will see D-Sub 15 pin input ports for each PC. * This is a special order and as a result, a minimum quantity is required.